I also prepared chunky boiled potatoes, flavored with onions sauteed in butter, and a sprinkled with chopped fresh dill weed, to accompany each serving of the main dish. It was a perfect combination of meat and veggies. 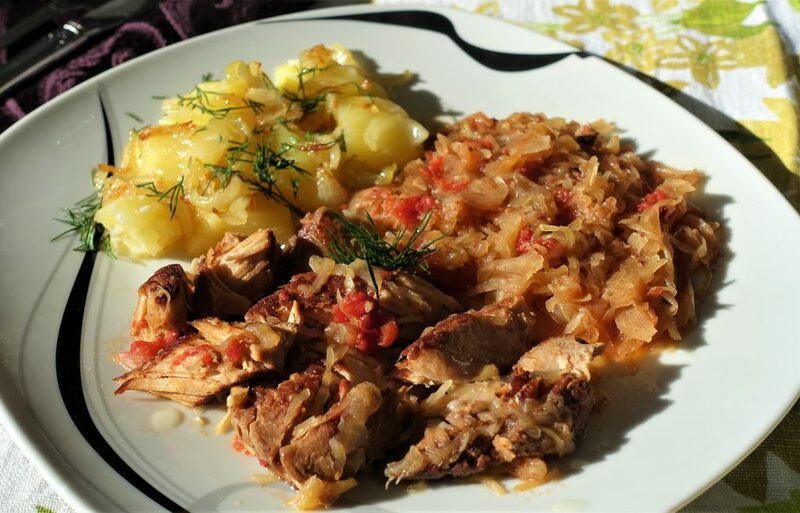 I also removed the bones from the meat, before serving it in chunks, side-by-side with the kraut, as pictured above in the casserole dish. Rinse the meat, and pat it dry with paper towels. Season the meat with salt, pepper, and garlic powder. Heat a large skillet, and add 2 Tbsp. of canola oil. Brown the meat on all sides, remove and set aside. Add more oil to the pan if necessary, add chopped onions, and saute until translucent. Add shredded carrots and celery, and saute for 15 minutes, then add the shredded apple and saute 2 more minutes. Add the chopped garlic and saute 1 minute. Drain and rinse the sauerkraut in a colander, then place it in a large bowl. 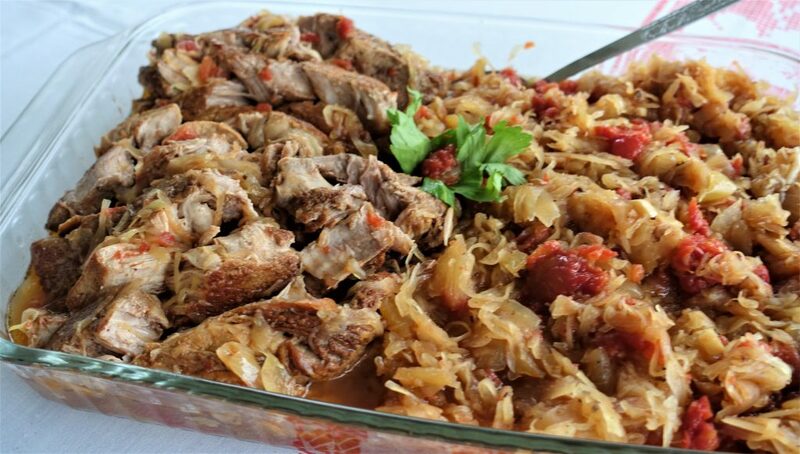 Combine the kraut with the sauteed veggies, chunky tomatoes, and caraway seeds. Pour 2 cups of the beef broth into the crock pot, and begin layering the meat alternating it with the kraut mixture, until all used up. The top layer should be kraut. Pour the last cup of broth over the top layer, add a bay leaf, and cover the pot.